I had the awesome opportunity to attend Planet Comic Con and it was everything I hoped it would be. There were cosplayers. There were fantastic panels. There were celebrity guests (Cary Elwes). Basically, if you are a fan of comics/movies/TV/gaming/POP CULTURE – and your psyche can handle fighting through thousands of people; this is the event for you. As my first time at an event like this was definitely a learning experience. Being that it was my first convention, I had nothing to compare it to though I asked the many who have been multiple times how this year stacked up to years prior. there’s a sense of enthusiastic, creative, and obsessively loving heart at the center of the convention that’s particularly present in its attendees. Everyone was happy to be there, happy just to be amongst their fellow nerds, obsessing and loving the same things together with abandon and pure, unadulterated glee. 2) Resign yourself to the fact you will be waiting in lines. 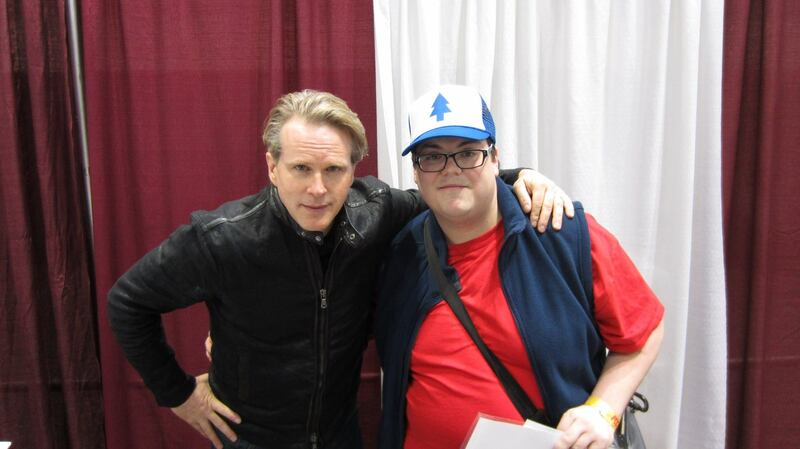 I waited in line close to an hour and a half to meet Cary Elwes(this was on Friday). Saturday the lines just got worse. 30-40 min lines for food. You thought Disney World was bad? Some exhibitors hand out free swag. Though I didn’t have that hard of a time repacking my roommate did. We made it work though. 4) Bring an external battery for your electronics. If you’re like me, you will be taking LOTS of pictures. and your devices will eat up battery like none other. 5) Pack lunches, if possible. The food at the Center is INSANELY expensive. For a sandwich, fries and a drink you’re probably looking at $12-$16. Not only that, the lines end up getting ridiculous too. If you’re like me and never have cash, that needs to change. There were many instances where lines were shorter if you paid with cash, some exhibitors didn’t have credit card machines at all. Make sure you get your cash before getting to the Con. Lines at the ATM are long AND there are convenience charges. Planet Comic con is the perfect place for entertainment nerds. Attendees are really accepting, excited, and there to have a great time. Although your feet and wallet might be hurting, I dare you to not have fun at the Con. After all, you may get to see one of your favorite artists/writers/actors/filmmakers/etc. in real life! Let your inner fanboy/fangirl run wild.